To Cite: Seddighi A S, Seddighi A, Amir N, Nima M K. Multi-Segmental Intramedullary Epidermoid Cyst Causing Low Back Pain and Urologic Dysfunction, Int J Cancer Manag. 2017 ; 10(12):e9310. doi: 10.5812/ijcm.9310. Introduction: Epidermoid cysts (ECs) are rare, slow growing tumors which usually affect lumbosacral area as an extramedullary lesion and mostly associated with spinal malformations. In this report we describe a very rare case of multi-segmental intramedullary EC. Case Presentation: A 42- year-old male presented with low back pain and paresthesia of left lower limb and also intermittent urinary retention. Urodynamic study showed weak contractions in bladder. MRI demonstrated multi-segmental lobulated intramedullary lesion extending from C7 to L2, which has high intensity on both T1 and T2-weighted images. Laminectomy of T11-L3 for symptomatic parts of the lesion and subtotal resection of the tumor was performed and histopathological investigation confirmed EC. Conclusions: Prompt evaluation of every patient with combination of neurological and urologic disturbances should be carried out. This report suggests that rare intraspinal tumors such as EC may affect multiple locations of the spinal cord, thus appropriate surgical intervention may prevent unwanted sequelae. Epidermoid cyst (EC) was first described by Croveilhier in 1835, calling them tumors perle’es (pearly tumors) (1). These rare and slow growing neoplasms raise from primitive germ cell layers (2). Spinal ECs represent less than 1% of all intraspinal tumors. ECs most frequently affect the lumbosacral area (60%) followed by upper thoracic (10%) and cervical regions (5%) (3). True intramedullary ECs are rare, with less than 60 cases reported till 2009 (4). The ideal treatment modality for EC is complete surgical resection; however, due to capsule adherence to the spinal cord and nerve roots, subtotal resection is preferred by the surgeons (5). We report a very rare case of a C7-L2 intramedullary multi-segmental EC of a male patient which causes low back pain and intermittent urinary retention, who was treated by T11-L3 laminectomy and subtotal resection of the tumor. The patient was a 42-year-old male presenting with low back pain which radiates to left lower limb and it was associated with tingling and numbness from 2 months ago. Patient also suffered from intermittent urinary retention in the past year. Patient did not mention previous radiotherapy, trauma, operation, lumbar puncture, significant infection and abscess formation in cervical, thoracic and lumbosacral parts of spinal column. Also, the patient did not experience hydrocephalus or cerebral shunting during infancy and childhood. Physical examination revealed hypoesthesia on left L3 dermatom. Reflexes, forces and skin were normal on examination. Also, urodynamic study showed weak contractions in bladder. 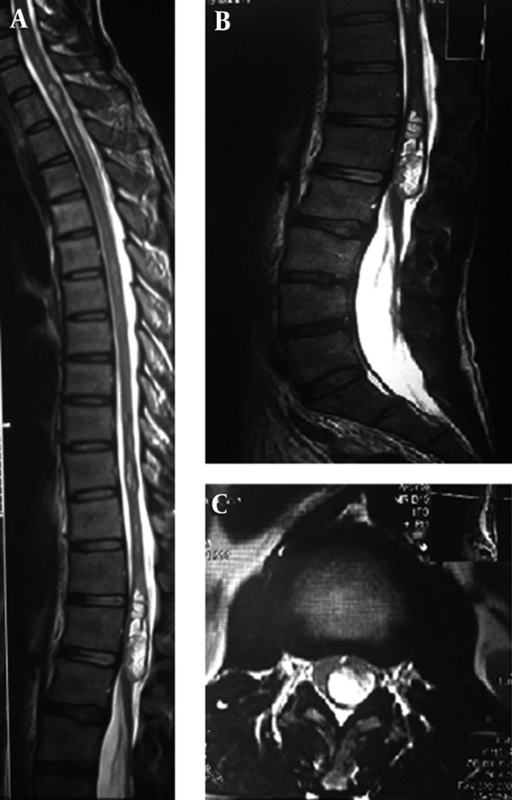 Whole spine Magnetic Resonance Imaging (MRI) was performed for the patient and a large multi-segmental lobulated intramedullary lesion was noted. The lesion was a solid-cystic mass extending from C7 to L2 with most tumoral bulk located in T12 to L2 area with hyperintense signal on T2-weighted sequence. (Figure 1) Based on the clinical scenario and imaging findings, decision was made to perform T11 to L3 laminectomy and subtotal resection of the tumor. (Figure 2A) Hematoxylin and Eosin staining of the lesion revealed multiple fragments of tan yellowish soft and pasty tissue in macroscopic view. Flaky keratin lamellar material and surrounding stratified squamous epithelium were noted as microscopic features (Figure 2B). Based on clinical, imaging and histopathological study, diagnosis of EC was established. Non-symptomatic portion of the tumor was followed conservatively and no new symptom or tumor growth was seen in 3 years after the surgery. Figure 1. Preoperative Magnetic Resonance Imaging. Multi-segmental lesion with high signal intensity on T2-weighted MRI extending from C7-L2 vertebrae. (A) Largest section of lesion appeared on sagittal (B) and axial (C) T2-weighted lumbosacral MRI. Figure 2. A, Postoperative Magnetic Resonance Imaging. Laminectomy and tumor bulk reduction is obvious on sagittal T1-weighted lumbosacral MRI. B, Histopathological study by Hematoxylin and Eosin staining showed stratified squamous epithelium wall, with cavity of keratinized material, diagnostic of Epidermoid Cyst. Written informed consent was obtained from the patient with ethical approval of Ethics Committee of Shohada Tajrish Hospital. ECs are often intradural and extramedullary and are located in lumbosacral area (6). Only three cases have been reported with cervical cord involvement (7). Roux et al. reviewed 47 cases with intramedullary spinal ECs and summarized that the average age was 34 and male to female ratio was 1.35:1 (8). These lesions are either congenital or acquired. Acquired ECs have been found years after repeated lumbar puncture or meningocele repair or trauma and are thought to result from iatrogenic penetration of skin fragments. The interval between initial procedure and the finding of the cysts is 5 - 6 years (9). Congenital ECs which are more common and often associated with other spinal dysraphisms are caused by anomalous implantation of ectodermal cells during closure of neural tube between the third and fifth weeks of embryonic life (10). Symptoms depend on location and extent of the mass and are the result of space occupying lesion causing compression to the adjacent structures. Motor and sensory disturbances, pain and urologic dysfunction frequently occur (11). Since EC does not have specific imaging features, lesions such as spinal dermoid cyst, spinal arachnoid cyst and spinal neurenteric cyst should be kept in mind (12). EC shows variable findings on MRI; however, the lesion is usually isointense to hypointense in T1-weighted images and hyperintense in T2-weighted images. Although the cystic content of EC has the same signal as the cerebrospinal fluid (13), a thin rim of enhancement of the EC on gadolinium-enhanced MRI images has been inconsistently described (14). Moreover, Teksam et al. reported EC features on diffusion-weighted MRI, as the apparent diffusion coefficient (ADC) values indicated restricted diffusion within the lesion (15). However, these findings are not always constant on imaging modalities and some variations have been reported in the literature (16). High signal intensity on both T1 and T2-weighted MRI was noted for our presented case. Microscopically, ECs are cystic lesions with a fibrous and eosinophilic wall lined by stratified squamous epithelium containing waxy lamellated keratin (17). Surgical resection remains the mainstay of treatment for ECs. Although total excision without causing any neurological deficits is the ultimate goal, tight capsule adherence between spinal cord and the tumor makes it difficult (18). Despite the benign course of these indolent lesions, local recurrence is common in cases of subtotal resection (19). Symptomatic recurrences require surgical intervention; however, one case with repeated relapses of an intraspinal EC was successfully treated by radiotherapy (20). Posterior approach with T11 to L3 laminectomy and subtotal resection of the tumor was performed for the symptomatic part of this multi-segmental intramedullary EC in our presented case. No local recurrence or new neurological complaints were seen in the 3-year follow up after the operation. This is the first reported case of multi-segmental lobulated intramedullary EC in the literature. Although intramedullary spinal cord tumors are rare, diagnosis of EC in approaching a patient with multi-segmental intramedullary lesion should be considered. Significance of EC is that it can cause permanent neurological deficits and urological discomfort, if left untreated. Therefore, diagnosis and differentiation of EC from other lesions results in better surgical management and outcome. 1. Zavanone M, Guerra P, Rampini PM, Crotti F, Vaccari U. A cervico-dorsal intramedullary epidermoid cyst. Case report and review of the literature. J Neurosurg Sci. 1991;35(2):111-5. [PubMed: 1757803]. 2. Manno NJ, Uihlein A, Kernohan JW. Intraspinal epidermoids. J Neurosurg. 1962;19:754-65. doi: 10.3171/jns.1962.19.9.0754. [PubMed: 14469387]. 3. Kumar S, Gulati DR, Mann KS. Intraspinal dermoids. Neurochirurgia (Stuttg). 1977;20(4):105-8. doi: 10.1055/s-0028-1090362. [PubMed: 895969]. 4. Ozaras N, Sarıyıldız A. A Neglected case admitted with paraplegia, an intradural extramedullary epidermoid cyst. J Clin Exp Invest. 2012;3(2):270-2. doi: 10.5799/ahinjs.01.2012.02.0158. 5. Ogden AT, Khandji AG, McCormick PC, Kaiser MG. Intramedullary inclusion cysts of the cervicothoracic junction. Report of two cases in adults and review of the literature. J Neurosurg Spine. 2007;7(2):236-42. doi: 10.3171/SPI-07/08/236. [PubMed: 17688066]. 6. Bloomer CW, Ackerman A, Bhatia RG. Imaging for spine tumors and new applications. Top Magn Reson Imaging. 2006;17(2):69-87. doi: 10.1097/RMR.0b013e31802bb38f. [PubMed: 17198224]. 7. Gonzalvo A, Hall N, McMahon JH, Fabinyi GC. Intramedullary spinal epidermoid cyst of the upper thoracic region. J Clin Neurosci. 2009;16(1):142-4. doi: 10.1016/j.jocn.2008.04.017. [PubMed: 19013801]. 8. Roux A, Mercier C, Larbrisseau A, Dube LJ, Dupuis C, Del Carpio R. Intramedullary epidermoid cysts of the spinal cord. Case report. J Neurosurg. 1992;76(3):528-33. doi: 10.3171/jns.1992.76.3.0528. [PubMed: 1738035]. 9. Bansal S, Suri A, Borkar SA, Kale SS, Singh M, Mahapatra AK. Management of intramedullary tumors in children: analysis of 82 operated cases. Childs Nerv Syst. 2012;28(12):2063-9. doi: 10.1007/s00381-012-1835-4. [PubMed: 22772484]. 10. Guidetti B, Gagliardi FM. Epidermoid and dermoid cysts. Clinical evaluation and late surgical results. J Neurosurg. 1977;47(1):12-8. doi: 10.3171/jns.1977.47.1.0012. [PubMed: 864501]. 11. van Aalst J, Hoekstra F, Beuls EA, Cornips EM, Weber JW, Sival DA, et al. Intraspinal dermoid and epidermoid tumors: report of 18 cases and reappraisal of the literature. Pediatr Neurosurg. 2009;45(4):281-90. doi: 10.1159/000235602. [PubMed: 19690444]. 12. Altay H, Kitis O, Calli C, Yunten N. A spinal dermoid tumor that ruptured into the subarachnoidal space and syrinx cavity. Diagn Interv Radiol. 2006;12(4):171-3. [PubMed: 17160798]. 13. Munshi A, Talapatra K, Ramadwar M, Jalali R. Spinal epidermoid cyst with sudden onset of paraplegia. J Cancer Res Ther. 2009;5(4):290-2. doi: 10.4103/0973-1482.59913. [PubMed: 20160364]. 14. Hatfield MK, Udesky RH, Strimling AM, Kim BH, Sibergleit R. MR imaging of a spinal epidermoid tumor. AJNR Am J Neuroradiol. 1989;10(5 Suppl):95-6. [PubMed: 2505599]. 15. Teksam M, Casey SO, Michel E, Benson M, Truwit CL. Intraspinal epidermoid cyst: diffusion-weighted MRI. Neuroradiology. 2001;43(7):572-4. [PubMed: 11512590]. 16. Gupta S, Gupta RK, Gujral RB, Mittal P, Kuriyal M, Krishnani N. Signal intensity patterns in intraspinal dermoids and epidermoids on MR imaging. Clin Radiol. 1993;48(6):405-13. [PubMed: 8293647]. 17. Cincu R, Lazaro JF, Liesa JL, Callizo JR. Dorsal intramedullary spinal epidermoid cysts: Report of two cases and review of literature. Indian J Orthop. 2007;41(4):395-7. doi: 10.4103/0019-5413.37005. [PubMed: 21139798]. 18. Scarrow AM, Levy EI, Gerszten PC, Kulich SM, Chu CT, Welch WC. Epidermoid cyst of the thoracic spine: case history. Clin Neurol Neurosurg. 2001;103(4):220-2. [PubMed: 11714565]. 19. Amato VG, Assietti R, Arienta C. Intramedullary epidermoid cyst: preoperative diagnosis and surgical management after MRI introduction. Case report and updating of the literature. J Neurosurg Sci. 2002;46(3-4):122-6. [PubMed: 12690335]. 20. Bretz A, Van den Berge D, Storme G. Intraspinal epidermoid cyst successfully treated with radiotherapy, case report. Neurosurgery. 2003;53(6):1429-31. [PubMed: 14633311].